Zylie The Bear is headed on her biggest Adventure! Zylie is taking over New York City, making new friends and shooting a fun music video on Wednesday, November 20th through Saturday, November 23rd. Zylie's last stop on her NYC tour will be at FAO Schwarz (5th Avenue and 59th Street) in New York City on Saturday, November 23rd from 2-5! They are giving away tons of Zylies, books, accessories and $100 gift cards to FAO Schwarz at that time plus some other great things. Best of all you can meet a LIFE SIZE Zylie and take pictures with your family, friends and of course, Zylie to upload instantly! Can't make it to FAO? 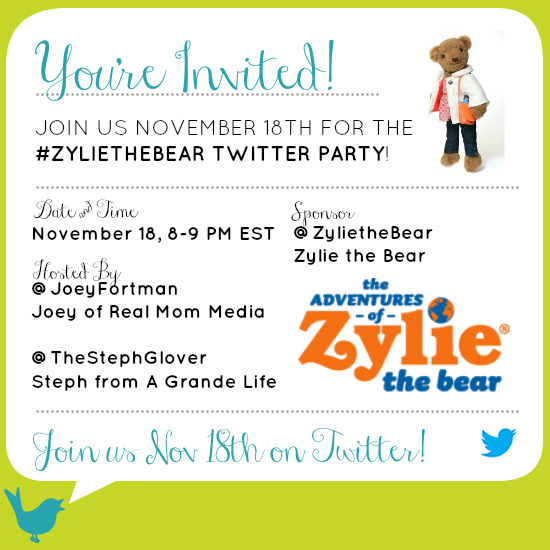 Then join @ZylietheBear, @joeyfortman and @TheStephGlover on Twitter on Monday, November 18th from 8-9p ET to win fab prizes and have a fun time from your living room! 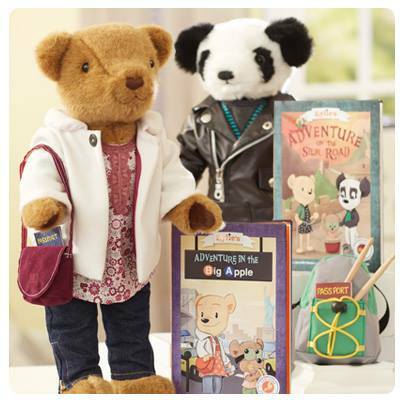 Prizes: 3 lucky winners will be receive their own Zylie the Bear to take on an adventure! To be eligible to win the prizes, you must RSVP using the Rafflecopter Form below, then follow Joey and Stephanie and participate in the Twitter party!